Editor Charles H. Smith's Note: This paper is probably Simpson's most celebrated analysis of the various forms of species dispersal. Original pagination indicated within double brackets. Notes are numbered sequentially and grouped at the end, with the page(s) they originally appeared at the bottom of given within double brackets. My thanks to the Washington Academy of Sciences for permitting the reprint. Citation: Journal of the Washington Academy of Sciences 30 (1940): 137-163. [[p. 137]] It was well known to the ancients that different regions of the earth were characterized by different sorts of animal life. The Roman emperors seeking all manners of beasts for their diversions knew that they must send to various countries each inhabited by characteristic animals. Later, when European travelers began to penetrate the far reaches of the earth, among the first questions asked them was what peculiar creatures inhabited the deserts of Tartary or the jungles of Ethiopia. Cartographers delighted in putting pictures of native animals on their maps, and their efforts to amaze and to embellish produced the first zoogeographic charts. Generations secure in the belief in the creation of things as they are seldom sought any explanation of the differences in fauna between one region and another, and few men obscurely guessed that this might be the outcome of a shifting history rather than the static result of divine command. The rise of science in its modern form found here a whole series of fascinating problems ready to hand. From a descriptive point of view the main outlines of the present distribution of mammals were long since correctly sketched, and now almost all the details are also known. Confident that the processes of nature are orderly and can be summarized by general theories and explained by general principles, the students of the nineteenth century began the attempt to deduce from the present faunal distribution the historical sequence that led to it. In this new field of inference many blunders were made (and we are surely still making some) because of the lack of historical documents. On this basis alone, the history really can not be deciphered, any more than one could reconstruct the political history of Europe from the present boundaries of its nations if all actual records of the past were destroyed. Here the paleontologist came to the rescue. His discoveries are the historical documents of animal [[p. 138]] distribution. They have solved many problems in this field and at the same time they have revealed many others as yet unsolved. Among the plainest inferences from the study of recent mammals is the fact that some of them have been able to cross regions that are now impassable to them. Aquatic animals have somehow traversed areas now dry land, and land animals have gone from one area to another now isolated by a barrier of water. The paleontologist was called on to reveal how such movements were possible and when and under what conditions they occurred. Now geologists became vitally interested. Caring nothing about the distribution of animals as such, they care a great deal about the past distribution of land and sea, the evolution of climates, the rise and fall of connections between the continents, and other problems that are involved in or that depend on paleontological studies of distribution. Research in this field constantly assumes new aspects and touches new fields of knowledge until from being a curiously specialized and abstruse detail it has become vital for work in several different sciences and has acquired importance and meaning for anyone who takes any intellectual interest in the world in which he lives. When I undertook to discuss this subject, it was my first intention to take up the various theoretical land bridges from one continent to another and to summarize the evidence for and against each one in order to produce a historical account of where and when such bridges have existed. It soon became apparent that such an account, if it were to have any value, would involve a mass of detail that would, indeed, be of interest only to specialists in this field. It also became evident that relatively few such specialists have risen above this mass of detail to make a conscious survey of the general principles involved and of the basic assumptions underlying their studies. Such a general survey is, then, not only of wider interest but also fresher and more needed in the present stage of study. Fig. 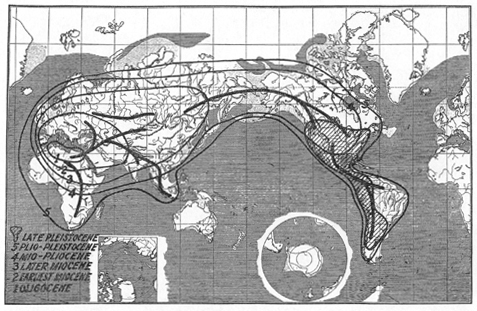 1.--Diagram showing various theoretical explanations of the spread of a group of mammals from one place to another. The given facts are that the group occurs at both A and B and is known at B later than at A. The numbered circles represent the limits of distribution of the group at successive times, from 1 to 5. [[p. 140]] the rise of a migration route between continents is then taken and what happened to the continental faunas as a consequence is briefly considered. Regarding the usual relationship of spatial distribution to time, there are two extreme theories, that of "age and area," expounded by Willis (1922), and that of "hologenesis," advanced by Rosa (1931) and supported in its zoogeographic implications by Fraipont and Leclerq (1932). Willis is a botanist and bases his theory mainly on plants but believes it probably also applicable to mammals. His basic postulate is that new forms of life originate in definite, limited regions from which as centers they expand slowly and steadily as time goes on. Then, as a rule with exceptions, at any given point in time, the area occupied by a form of life should be directly proportional to the age of that form of life. The theory involves various interesting corollaries, such as the belief that endemics or isolated forms of life with narrow distribution are usually young forms that originated where they are found and are just starting on their careers of expansion. Rosa's theory of hologenesis, on the contrary, has the basic postulate that a new form of life appears simultaneously over a great area, over the entire range occupied by an ancestral form or predecessor. There is, then, no such thing as a center of distribution or a cradle of any form of life. The distribution, as a rule with unimportant exceptions, is at the beginning as wide as it will ever be. Migration (in any sense, or expansion), if it occurs at all, is so insignificant that [[p. 141]] the broad features of distribution are about what they would be if migration never occurred. The area covered by a form of life tends always to decrease, not to increase. Hence as a rule area is inversely, not directly, proportional to age. The corollary regarding isolated forms of narrow distribution is that they are necessarily the relicts of old groups once more widely distributed. To a more or less orthodox zoologist Rosa's theory seems at first sight so fantastic as hardly to warrant serious discussion. This is still more true of some of the nongeographic aspects of the theory of hologenesis not pertinent here. It seems so obvious that most of the essential geographic implications of the theory are incorrect that I shall not devote time to disproving them, but it is necessary to recognize considerable merit in the work of Rosa, especially as supplemented by Fraipont and Leclerq, less on the theoretical side than in the description and emphasis of real sequences of geographic events. From this limited point of view both the age and area theory and that of hologenesis give true but incomplete pictures. One theory reaches an unsatisfactory conclusion, as far as mammals are concerned, and the other departs from an unsatisfactory postulate, but the combination of the less disputable parts of the two gives a satisfactory result. One of the many moderate opinions intermediate between the extreme views of Willis and of Rosa is that of Matthew (1915, 1939). Matthew's main thesis, now well known, is that groups tend to spread from centers, that the marginal forms are generally conservative and the central forms progressive, and that most of the main, primary centers of such spreading have, for mammals at least, been in the Northern Hemisphere, most southern mammals being relatively primitive types pushed away from the north by peripheral expansion about these centers. This thesis is not under discussion in the present paper, but the general type of geographic history assumed by Matthew to be typical for mammals is that here more explicitly supported. Writing in 1915, before the recent denials of the existence of centers of dispersal, Matthew took these as universally admitted. His work is full of examples of contracting phases in mammalian geographic history, and it was mainly on a consideration of these that he built his theory. As a concrete example of expansion and contraction, the distribution of the mastodonts is enlightening and was chosen by Fraipont and Leclerq as one item of evidence for hologenesis. Their map shows a Tertiary distribution essentially world-wide except for Australia [[p. 142]] and a Quaternary distribution including all North America, a spot in Ecuador, one in India, and one in Java. It is not fatal to their theory that their facts are not straight. Mastodonts entered South America only at the end of the Tertiary and were typically Quaternary all over that continent. They died out in the Old World near the beginning of the Quaternary and are typically Tertiary, only, in those continents. The fatal flaw in the hologenetic presentation of mastodont history is not factual but in the method of generalization. Lumping the Tertiary as if it were a single point in time, they make it appear that mastodonts arose in situ everywhere, which is their thesis but which is certainly contrary to fact. In the Oligocene mastodonts are known only from northern Africa. Many great Oligocene faunas from other continents are known, and it is inconceivable that mastodonts or any possible ancestors of mastodonts would be (as they are) entirely unknown in them if these then already had anything comparable to their maximum distribution. Similarly it is as nearly certain as such conclusions can ever be that mastodonts were present in Eurasia (known in the Lower Miocene) earlier and thence spread to North America (not known until Upper Miocene) and that they were in North America long before they reached South America (not known until the end of the Pliocene) and spread from North America to South America. 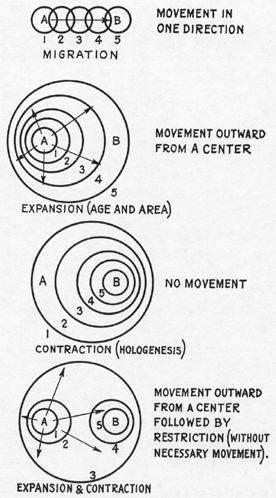 These facts are consistent with the age and area idea of expansion from a center and are radically inconsistent with the hologenetic idea of simultaneous appearance throughout the whole range. On the other hand, as mastodonts declined it is evident that their area greatly diminished until only one or a few relicts were left in relatively limited regions. This part of the history, if taken alone, is consistent with hologenesis. It is not, in itself, inconsistent with age and area, which admits the reality of such cases as exceptions, but it becomes inconsistent if shown to be usual rather than exceptional, and this can, I think, be shown. 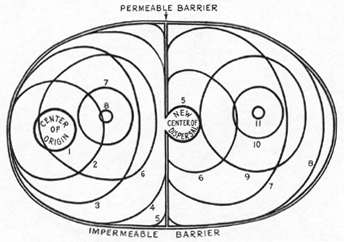 The accompanying map (Fig. 2) epitomizes what is known of mastodont distribution in space and time. I hold no brief for the accuracy of this map in detail: there are great gaps in knowledge, and later discoveries will necessitate changes in the distribution boundaries of the map, which are time contours or isochrones of mastodont expansion and contraction. These isochrones are, however, consistent with what is now known (which the map of Fraipont and Leclerq is not), and I venture to predict that later changes of detail will not much affect the general character of their pattern. Fig. 2.--Approximate known distribution of mastodonts at various times. The numbered lines, 1 to 5, represent stages in the expanding phase, the shaded area a nearly terminal stage of the more rapid contracting phase. The heavy lines roughly represent some of the major lines of travel, or so-called migration routes. The expansion of a group of animals involves actual motion. Individual animals must move from place to place, and some of them must travel where their immediate ancestors had never been. The population as a whole must move outward along its periphery. Contraction does not, or need not, involve any motion. It does not necessarily mean and in reality very seldom means a contraction of the population in the sense that there is predominant inward motion along the periphery. It involves rather a process of disappearance or extinction, commonly preceded by a general lowering or attenuation of the population. A population may decrease greatly and actually be well along in its contraction phase before it loses any significant amount of its range by local complete extinction. This phase of contraction can not be simply represented by contours as in the accompanying diagrams, and this essential difference between expansion and contraction must be understood if the diagrammatic representation is not to be misleading. An excellent descriptive analogy is provided by the expansion and contraction of ice caps. In their expanding phase there is actual movement outward from a center. They may begin to contract even while the movement is still outward, but their definitive contraction is accompanied by stagnation, with thinning of the ice (attenuation of the animal population) before any considerable regression is obvious. Commonly parts of the ice mass will be isolated and remain in situ until they melt entirely, just as relicts of once widespread animal groups may be isolated in one or in several separate regions before they become extinct. Fig. 3.--Diagram of a common type of mammalian expansion and contraction, exemplified in varying detail by the mastodonts and other groups. The numbered lines 1 to 11, represent limits of distribution at various times. 1 to 5 represent the primary expansion of the group on the land-mass where it originated, 5 to 8 contracting phases here. At time 5 it crosses a barrier and from 5 to 8 expands on a second land-mass, contracting there from 8 to 11. From 6 to 8 the group has discontinuous (disjunctive) distribution in two areas. After 8, it is extinct in its home-land but survives abroad. After 11, it is everywhere extinct. the expanding or in the contracting phase and on the relative speed of these phases. It seems probable that at the present time, including the recent past, more mammals are actually in the contracting phase, so that age and the area is a poor guide to the recent distribution of this particular group of animals. One other striking detail is that we can as yet seldom follow the actual expansion of a group of mammals within its set of barriers. Sometimes related mammals do really seem to appear all at once over the whole of a great area inhabitable by them, and subsequent [[p. 146]] expansion, if it occurs, is not such in the simple age and area sense but is by flooding through a broken barrier: this is in part true of the spread of mastodonts into North America in the Miocene.4 It is these cases of sudden widespread appearance that are used to support hologenesis, but the support is spurious.5 One reason for the apparent widespread simultaneous appearance is the imperfection of the record and of our interpretation of it. For any one age we are lucky to get one good fossil deposit on a continent and almost never have deposits so placed all over a land mass that the expansion could be recorded. And even if we did have such ideal data, our usual methods of correlation would very seldom permit so precise a following of the real sequence. We usually establish a theoretical sequence by assuming (doubtless contrary to fact but as a workable approximation) that given types of mammals did appear simultaneously over the whole area--obviously it is then ridiculous to expect this sequence to show that they did not. Only when different faunas cross barriers and impinge on one another is it easy to show that expansion has occurred. The other reason is that the expansive phase of mammals is normally very rapid unless definite obstacles slow it down. Once a group of mammals gains access to a land mass, it tends to spread over it in the wink of an eye, geologically speaking. A century or a millennium may suffice, and in most cases such periods are imperceptibly short to the paleontologist.6 Only in dealing with recent mammals is one likely really to see expansion taking place on a smaller scale. Mammalian distribution as the paleontologist sees it is thus seldom concerned with the spread of any group on a single land mass. Relatively local differences are usually to be assigned to environmental or facial causes, while differences between larger areas are usually to be interpreted not primarily from the age and area viewpoint of simple time elapsed but more from the point of view of the rise, fall, and character of intervening barriers. The paleontologist's [[p. 147]] cardinal principles (open to exception) are (a) that strong differences between approximately contemporaneous mammalian faunas of similar facies imply an intervening barrier and (b) that strong resemblances between such faunas denote an intervening connection. Thus the paleontologist would seldom conclude that a given sort of mammal occurred on one continent but not on another simply because it had not had time to reach the second, but because there was no likely way for it to get there. If, then, this sort of animal did later appear on the second continent, he would normally conclude that something had happened to provide the means of getting there, and not that the animal only then got around to using the means that existed all along. These interpretive principles are widely accepted, so much so that real exceptions to them have greatly confused zoogeographers.7 Generally true, they are the basis on which the paleontologist and zoogeographer collaborate with the geologist in establishing the probable presence or absence of land connections between the continents in past times. If no barrier at all exists between two areas, it is to be expected that their faunas will be very similar, or as far as genera or larger groups are concerned practically identical. Such radical differences as exist will be mainly or wholly caused by the survival or development of local forms in some narrow environment, that is, will be facial and not geographic in a broader sense. As an example, a comparison of the living mammals of Florida and New Mexico (Simpson, 1936) shows the degree of similarity attained by areas in which there is no significant geographic barrier but where the local climates and facies are almost completely different in the two areas. For various reasons not pertinent here, the mammalian fauna of Florida is relatively small, with only a quarter as many species as in New Mexico, but of the orders of mammals present in Florida, all occur in New Mexico, of the families over nine-tenths, of the genera two-thirds, and of the species nearly one-fifth. If these were fossil faunas resemblance this great (or, as is often the case, greater) would warrant the conclusion that no barrier did exist between the two. This criterion can be applied in close parallel. It was formerly sometimes supposed that when Florida first definitively [[p. 148]] appeared as dry land in the mid-Tertiary it was not yet connected with North America. Now we have from there Middle Miocene mammalian faunas with ten genera surely and six others doubtfully identified. Of these, all but one are common in contemporaneous beds in western North America. The conclusion that there was no sea or other notable barrier between Florida and these States is inescapable. Such evidence suggests not merely that a bridge existed but that none was needed; that the two areas were part of a single land mass. When two regions are separated by a strong barrier, they develop quite different faunas, the differences being roughly proportional to the lapse of time since the regions were connected. If now some means of passing the barrier appears, the two faunas intermingle, but usually the result is not the production of a single fauna even in the sense that Florida and New Mexico have one fauna. Several factors are concerned in the usual fact that such regions tend indefinitely after they are united still to have distinctive faunas, despite their sharing of some faunal elements. From this point of view the fact that the regions often are different environmentally exerts a profound effect, but one not of primary importance in the phenomena here considered because the effect might have been analogous even if the regions had always been united. A more important factor is that biological pressure of immigrant forms may inhibit the expansion of some groups in one region without being sufficient to cause rapid extinction, although in such cases extinction usually follows sooner or later. Equilibrium does occur but is seldom or never permanent. Another and for the present subject a more important reason for the continued distinction of two faunas between which a barrier-crossing has been established is the character (including the position) of that crossing. Its approaches may be inaccessible for some animals, and of course they can not use a bridge that they can not reach. 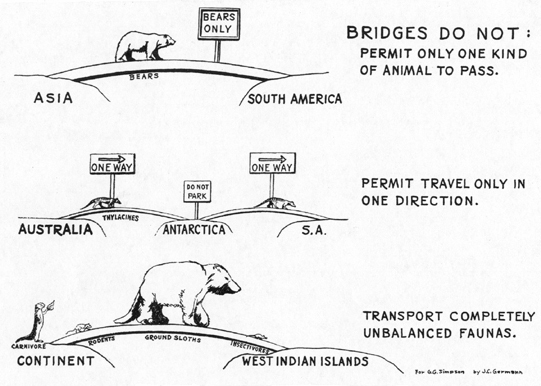 From the animals that do expand into a new land mass, it is sometimes possible to infer where the bridge was. Thus when North America and Asia had a great faunal interchange in the Pleistocene, no mammals then confined to southern North America reached Asia and none then confined to southern Asia reached North America. Obviously the bridge was in the north and exclusively southern animals could not reach it. It is also noteworthy that none of the mammals that had come into North America from South America reached Asia. To reach North America they had to come through the Tropics, and none [[p. 149]] was sufficiently adaptive also to pass over a relatively cold bridge. In the inference of intercontinental land connections from faunal relationships it is, therefore, wrong to demand that anything like a complete faunal interchange be adduced as evidence of the existence of the connection. A wide-open, nonselective connection, a corridor, is the only sort that could approach such a result, and these are rare.8 In the whole history of mammals there are exceedingly few cases (e.g., Lower Eocene between Europe and North America) where the evidence really warrants the inference of a wide-open corridor between two now distinct continental masses. The usual sort of connection is selective, not acting as a corridor or open door but as a sort of filter, permitting some things to pass but holding back others. From the probable mechanism of such filtering of faunas, it follows that these connections were usually of narrow environmental scope and their continental abutments limited, drawing only on one faunal zone of the continent, not on its fauna as a whole. In other words, the usual evidence for such connections does not suggest "lost continents" comprising parts of two or more as they exist today, or even broad transoceanic pathways, but relatively restricted links. The analogy of a bridge for such selective or filtering connections is fairly good, and it is to them that the term "land bridge" most properly applies. Fig. 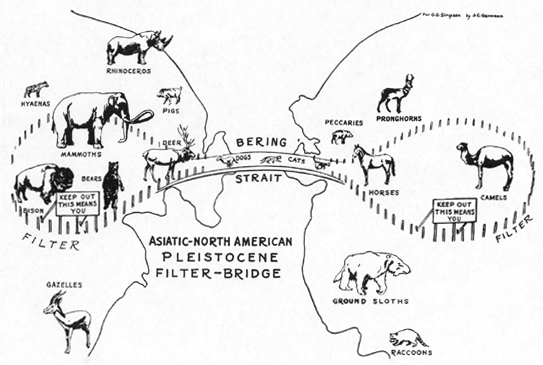 4.--Diagrammatic conception of Asia-North America Pleistocene filter-bridge. [[p. 151]] best fits the zoological evidence in such cases of extensive but filtered faunal interchange is an isthmian link in the sense of Bailey Willis (1932). The broad land bridges of many paleogeographers should be corridors from a faunal point of view, but isthmian links, more nearly than any other geologically postulated connections, fill the requirements of a filter-bridge, which the faunal evidence shows to be the usual type of intercontinental connection although, of course, by no means the only type. When it is recognized that a filter-bridge does not lead to an integral transfer of continental faunas, it is a practical problem to determine what sort and degree of resemblance does indicate such a bridge. There have been students who did not hesitate to build extensive individual bridges in all directions to account for peculiarities of distribution in single forms of life. Thus, to mention only a few of his many connections,9 Joleaud (1924 and elsewhere) has an individual Late Oligocene route from Haiti to west-central Africa for insectivores, one diagonally across this from Brazil to northwestern Africa in the Late Eocene for certain rodents, one in the Early Miocene straight across the Atlantic from the United States to Spain for a genus of horses, Anchitherium, one at the same time parallel to but south of this from northern Africa to Florida for the mastodonts, and so on. Similarly, von Ihering built a special bridge across the Pacific from South America to Asia for raccoons and bears,10 and examples could be multiplied. Aside from geological considerations, which in themselves are almost enough to exclude these particular bridges at these places and times, and aside from what are now known to be errors in the factual data adduced for them, such individual, self-service bridges are supposed to have acted in a way in which no surely established bridge is known to have acted, and I can not believe in their reality. The second and perhaps the best criterion of the reality of a land bridge is that even though it rarely transports whole faunas, it does tend to transport integrated faunules. It does not transport all the genera of a continent, but neither does it transport one genus all by itself. For instance, it is improbable that only herbivores or only carnivores would cross such a bridge (although they need not both cross in the same direction). Where herbivores go, carnivores can and will accompany them, and carnivores can not go where there are no herbivores. The postulation of land bridges on the basis of one or a few mammals is thus very uncertain. Unless there is reasonable possibility that their companions have not been discovered, a theoretical bridge based on such evidence is probably unreal. Fig. 5.--Diagrammatic conception of filter-bridge incompetence. There are also instances of the appearance of isolated immigrants on continental masses. A curious and relatively neglected example, among many that might be cited, is that of the sudden appearance in South America of small relatives of the North American raccoon. These procyonids appear as fossils in the Late Miocene or Early Pliocene of Argentina definitely before any of the other carnivores or any of the abundant North American ungulates reached there. Since in this case a filter-bridge certainly existed at a later time, it is usual to assume that the procyonids came on this bridge and that their appearance dates the formation of the bridge as a practicable migration route or true and complete filter-bridge. If, however, we consider only the time when the procyonids did appear, disregarding our knowledge of what was destined to happen later, such a conclusion is not warranted. If my previous remarks as to filter-bridges are true, or are acceptable as a theory of general tendencies, then it is wrong to conclude that a bridge can account for the appearance of this one group of small carnivores and no other animals of similar geographic origin at that time, unless the bridge was then so nearly impassable as not to warrant the name in its usual accepted sense. Fig. 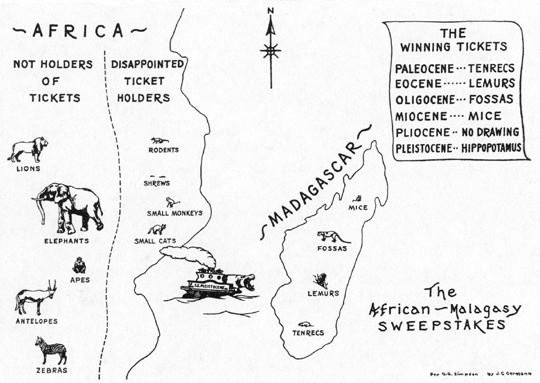 6.--Diagrammatic conception of the "sweepstakes" route between Africa and Madagascar. [[p. 156]] by sporadic transportation of land animals on natural rafts, without the existence of a dry-land route (Matthew, 1918, 1939). This opinion has been severely criticized in some quarters. It has been claimed or felt, even by some adherents of Matthew's general thesis of "Climate and Evolution," that this sort of adventitious migration is dragged in when necessary to explain away any facts that contradict the main thesis. It has not been sufficiently emphasized even by Matthew that the role of such a theory may be positive and primary, not merely negative and supplementary. Adventitious migration has indeed been used and sometimes abused simply to get inconvenient facts out of the way of a favored hypothesis, but there are instances in which adventitious migration is itself the most probable hypothesis and the most economical theory. In the cases of the faunas of Madagascar and the West Indies, for instance, I strongly favor this explanation, and I do so not at all in order to explain away data for a land bridge where I do not want to believe in one--as Matthew has, quite incorrectly, been accused of doing. It is to be favored because it does explain, simply and completely, facts that the land-bridge theory does not explain. This sort of migration can be extended to include cases other than those of transportation by natural rafts, although doubtless these provide the most common instances. Any barrier, whether of water, climate, biota, or other, may or will be involved in such migration if its crossing at any one time is highly improbable but is not impossible. The action is not merely like that of a relatively less permeable filter but is different in kind as well as in intensity. A filter-bridge permits some animals to pass and holds others back, but in general those that can cross it do cross it and do so fairly soon after the bridge becomes available to them. It is relatively deterministic as to the fact of crossing, as to the animals that do or do not cross, and as to the time of crossing. An adventitious route, which I call "a sweepstakes route" to emphasize this characteristic, is indeterministic. Its use depends purely on chance and is therefore unpredictable and, except in a broad way, can not be clearly correlated with other events in time and space, as filter-migration can. This is, I think, the only theory yet advanced that really is capable of explaining all the peculiarities of the Australian fauna and many similar but less extreme peculiarities of land faunas in other parts of the world. That such theories have not received much attention and that they are uncongenial to many zoogeographers are perhaps a reflection of the mechanistic scientific philosophy dominant in the Victorian age, from which zoogeography has not fully emerged. Land-bridge migration seems more mechanistic because it is often more simply predictable. In fact, of course, it too depends on chance, but here on the chances of a probable event, whereas sweepstakes migration depends on the chances of an improbable event.12 The viewpoint involved is, I believe, new, and it merits detailed consideration, but this can not be given it here. Among other points, the physical nature of such sweepstakes routes needs study. It is not to be supposed that they are invariably island stepping-stones or that natural rafts are the sole means of transport involved. As an example of what actually happens when two continents are united by a filter-bridge, the case of North and South America is one of the most interesting and the facts about it are now fairly well known. These continents were separated (except, probably, for a sweepstakes route) almost throughout the Tertiary. Toward the end of the Pliocene they were united by an isthmian link antecedent and [[p. 158]] similar to that now existing, the Isthmus of Panama. For the mammalian faunas this was and is a filter-bridge. Just before the two continents were united, South America had about 29 families of land mammals and North America about 27.13 With two doubtful exceptions,14 they did not then have any families in common. Shortly after the union of the continents, in the Pleistocene, they had 22 families in common, 7 of South American origin, 14 North American, and 1 doubtful. Some extinction already having taken place, South America then had 17 native families still confined to it and North America 9.15 With further extinction and some further migration, the Recent faunas of these continents have 14 families of land mammals in common and there are 15 families confined to South America (not all native) and 9 confined to North America. There was thus a great faunal interchange but one that never produced even approximately identical faunas, involving many mammals from each continent but never all or even the majority--a typical picture of the action of a filter-bridge on the continental faunas at each end of it. In passing, there are various interesting facts involved in these summary figures. The South American fauna is now about as rich as it was before the interchange, but very different. North America has a decidedly poorer fauna than before the interchange, but its general composition has not changed so much as in South America. Both faunas reached their maximum in variety soon after the interchange and later declined. The broad outlines of what actually happened can be seen by summary of the histories of the various major groups of mammals involved. Certain groups expanded into the other continent and became permanently at home there, without losing much of their former range, the "age and area" type of expansion. The groups of which this is true were almost entirely of North American origin and include some rodents, especially the cricetids, most of the carnivores, and, among ungulates, the deer. Among South American mammals only the porcupine can unquestionably be placed in this category although there are one or two other less clear or more complex cases, e.g. the peba armadillo. [[p. 159]] Some groups seem to have been almost unaffected. It must be supposed of these that they had not reached a contracting phase in their history, that a barrier continued to exist for them (the filter-bridge filtered them out of the flow of mammals), and that the contact of new types of mammals was not lethal. This is true of a few more South American than North American mammals, but the difference is not significant. In North America the moles, pocket gophers, beavers, kangaroo-rats, prongbucks, bison, and a few others belong here. In South America the (tree) sloths, anteaters, most of the armadillos, the monkeys, and most of the native rodents (eight families out of twelve, and lesser groups in the other families) may be mentioned. Some of these managed to get onto the bridge (for instance several sorts of monkeys), but none really succeeded in crossing it. I do not know of any single unified theory that would account well for the fact that these animals did not cross the bridge and yet did not markedly contract. The age and area theory demands that they (or most of them) be new groups that have not yet had time for this expansion, but this is clearly false. Most of these are ancient types of animals in their own continent. All certainly have had ample time to cross the bridge if they were going to do so. They are not inconsistent with Matthew's "Climate and Evolution" theory, but neither does it explain them; these data are outside that field of theory. The reasons are probably too varied to be reduced to a formula more specific than that of general filter action. For many of these animals, such as the monkeys, the absence of necessary environmental conditions beyond the bridge is an evident reason for their stopping where they did. Others, like the bison, were evidently kept by analogous environmental barriers from reaching the bridge. In some cases, for instance many of the rodents, it is hard to believe that the physical, climatic, or floral environment can have sufficed to prevent their spread and the most reasonable inference seems to be that these animals were able to maintain their places in the shifting fauna around them, in the region where they were well acclimated, but not quite able to invade the same ecologic niches where these were already occupied under somewhat different conditions, even though these conditions would not have been deterrent if there were no competition. The explanation is vague and not very satisfactory because it seems unlikely that so delicate an equilibrium could long be maintained. Some groups began to contract at or soon after the time of faunal interchange. Doubtless some would have contracted anyway, but it [[p. 160]] can not be coincidence that so many did so just at this time. In North America there were few examples of this. Some North American groups have contracted since the connection with South America, but in these cases there is little doubt that the contraction had quite different causes and would have occurred regardless of the rise of the land bridge in question. In South America, however, the sharp contraction and eventual extinction of all the native carnivores (the borhyaenid marsupials) and, all the native ungulates (notoungulates and litopterns) undoubtedly were related to this event and so, probably, was the contraction, with or without extinction as yet, of various native rodents and of the caenolestid marsupials. It is highly improbable that none of these animals could have crossed the bridge successfully as far as most environmental factors go. Some of the notoungulates and borhyaenids, for instance, were ecologically similar to animals that did cross the bridge and they lived in environments abundantly available in North America. The only probable explanation is that these animals were biologically inferior to immigrants from North America. The impact of the latter not only prevented the expansion of these South American groups but also started or hastened their contraction. The contraction was slow in some cases, occupying a million years or more, but it effectively prevented acquisition of new territory and in most cases has now ended in extinction. In this instance, and probably this is the rule for mammals, expansion of groups that did expand was plainly more rapid than the contraction of those that did contract. (a) Of South American origin: Glyptodonts, ground sloths (several families). (b) Of North American origin: Gomphotheres (bunodont mastodonts),16 horses. [[p. 161]] (a) Of South American origin: Capybaras, armadillos. (b) Of North American origin: None. (a) Of South American origin: None. The first of these three categories can be dismissed (although hardly explained) as including groups that would have become extinct in any case but that happened to share in this last expansive movement before fatal restrictions set in. The last two are complementary and show an interesting relationship. No North American groups became extinct in South America and not in North America. If they became extinct in South America they were, so to speak, slated for extinction anyway and the new environment did not save them. On the other hand several North American groups became extinct at home but not in South America.18 These were, then, contracting groups, for which extinction was postponed by the change of environment. South America was an asylum for them in their retreating phase and the preceding expansion was rather an incident than an indication of potency against their old environment. Here again both the age and area and the hologenetic theories are far beside the point when confronted by the actual facts. On the other hand, this particular class of facts is broadly consistent with Matthew's views, especially when details here omitted are considered. These differences are statistically significant, the first surely, the second probably. The difference is far from significant. As far as these figures show, a family capable of spreading to the other continent was no more likely to survive than one that did not spread.19 Thus in the final outcome of the interchange, as far as yet reached, the ability of these faunas to expand and their ability to survive are both associated with geographic origin, or biologically with the general character of the historically northern, Holarctic, as opposed to the historically southern, Neotropical, fauna. But ability to expand and ability to survive are two different faunal characteristics in this instance with no apparent relationship to each other. Like so many phases of this great subject on which I have barely been able to touch in passing, this unexpected conclusion has far-reaching implications and merits much more detailed consideration than can now be given it. An enormous amount of work has been done to unearth the facts of faunal distribution in the past and present. [[p. 163]] Far less progress has yet been made in finding the broad interpretive principles that may be revealed by these facts. Here an effort has been made to indicate what a few of these principles may prove to be and, more particularly, to suggest a few of the lines of attack that may lead to clearer grasp of these and to the discovery of others. FRAIPONT, C., and S. LECLERQ. L'évolution. Adaptations et mutations. Berceaux et migrations. Actualités Scientifiques et Industrielles 47: 1-38. 1932. IHERING, H. VON. Die Umwandlungen des amerikanische Kontinentes während der Tertiärzeit. Neues Jahrb. Min. Geol. Pal., Beil-Bd. 32: 134-176. 1911. JOLEAUD, L. L'histoire biogéographique de l'Amérique et la théorie de Wegener. Journ. Soc. Amér. Paris, n.s., 16: 325-360. 1924. SCHUCHERT, C. Historical geology of the Antillean-Caribbean region or the lands bordering the Gulf of Mexico and the Caribbean Sea. John Wiley & Sons, New York, 1935. SIMPSON, G. G. Data on the relationships of local and continental mammalian faunas. Journ. Pal. 10: 410-414. 1936. _____ Antarctica as a faunal migration route. Proc. Pacific Congress of 1939, in press. 1940. WILLIS, B. Isthmian links. Bull. Geol. Soc. Amer. 43: 917-952. 1932. WILLIS, J. C. Age and area. A study of geographical distribution and origin of species, pp. i-x, 1-259. University Press, Cambridge (England), 1922.